At one time or another, we’ve all been the victim of an unflattering photo. Whether due to poor timing, unfortunate angles or a novice photographer who hasn’t quite learned how to capture people at their best, these sorts of shots are the reason social media sites created the “untag” button. When it comes to portraits of ourselves, we’re our own worst critics. Not to mention, as photographers, we spend so much time behind the viewfinder, we don’t always know what to do when it’s our turn on the other side of the camera. While digital cameras offer unlimited opportunities for warming up and finding your photo shoot comfort zone, instant photography provides a different experience. Because the amount of film left in your pack dictates the number of chances you have to snag the perfect shot, it’s important that you’re ready well before the shutter clicks. One of the most difficult aspects of posing is deciding what to do with your hands. Leaving your arms dangling by your sides conveys disinterest, but placing both hands on your hips can appear unnatural. For a more casual look, place only one hand on your hip, or in your pocket, and drop your shoulders back. In a group photo, tuck your elbows at your sides and put your hands on the backs of the people at either side. In some cases, it can help to hold a prop, such as a handbag, umbrella or even a cup of coffee. Keeping your hands busy can also help calm any pre-photo jitters. If the camera lens is not level with your line of sight, adjust yourself by stepping up on a curb or crate, sitting or slightly bending your knees. While many people automatically tuck their chin down before a photo, projecting your chin out just a few centimeters, then down, will slenderise your neck and accentuate your jawline. Few things are more cringe-inducing than a forced, fake smile. No matter how much you’ve practised your smirk, nothing can replace the warm glow of a genuine grin. Candid photos of happy subjects are an excellent way to capture the elusive natural smile, but achieving the same result in a posed portrait is slightly more challenging. As the photographer prepares for the shot, think of something guaranteed to make you smile—such as the antics of your pets, or a corny joke. However, be mindful not to smile too hard or your eyes will crinkle shut. If you can’t avoid a forced smile, opt for a serious look a la Victoria Beckham and communicate solely through your eyes. Last, but perhaps most importantly, pay close attention to how you’re standing. The old adage about the camera adding weight is not necessarily true, but poor posture can give the appearance of a heavier frame. Avoid slouching by keeping your back straight, shoulders down and chest forward. Also remember, depending on the available light, cameras have a tendency to flatten your physique. This is why facing the camera dead-on can make your body, and face, appear wider in photographs. By turning your body slightly to one side, the camera will capture natural highlights and shadows, and the results will be truer to your actual form. Keep in mind the most photogenic people are often the most confident. If you’re not comfortable in front of the camera, it’ll show up in your photos. Just as being a great photographer means constantly working to improve your craft, finding your most flattering pose also takes practice. 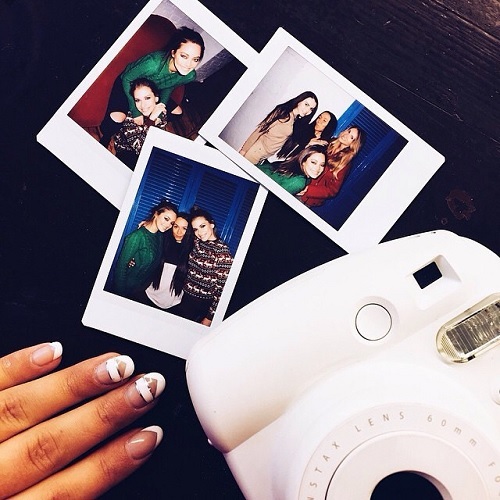 Take turns with your instax loving pals and you’ll quickly feel like a natural, on both sides of the camera. Whether you’re the photographer or the subject, the right camera makes all the difference. For stylish, unique photo results, check out the neo classic instax mini 90.